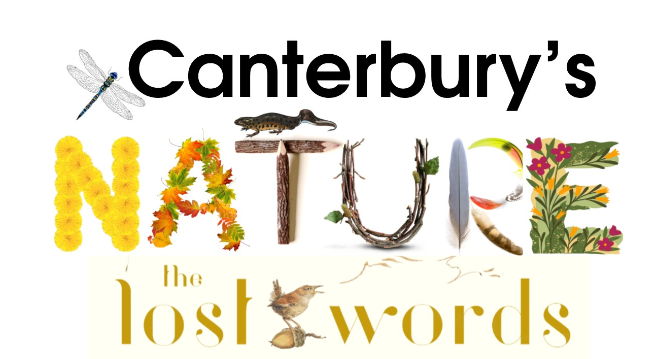 ‘Canterbury’s Nature – The Lost Words’ is an environmental education project aimed at children aged 4 to 11. It aims to provide a series of 7 workshops to help children connect with the nature & wildlife in their local communities, using the ‘Lost Words’ book as a source of visual and poetic inspiration. It is a partnership project which has developed from the Green Heritage Conference organised by Canterbury in Bloom last year. Our aim is to connect local communities with the nature on their doorstep through the design and delivery of fun-filled, creative and interactive activities, helping local families learn about, love and protect their local open spaces, heritage and wildlife. We are also interested to explore whether participants, young and old, can think of any words lost to Canterbury. Each park, garden or field will celebrate a couple of words from the book and a new ‘nature word’ that relates to plants or animals associated with that greenspace. Further dates at these venues to be announced soon! Limited spaces are available so booking is essential. All young people under the age of 16 must be accompanied by an adult. To book email info@annaoutdoors.co.uk or ring 07966 404 546. Creations made at activity workshops, photographs and interpretations of Canterbury’s lost wild words will be exhibited at various local schools and community centres to celebrate the project and raise further awareness of the importance of naming animals and plants. We hope our pilot will lead to further family activity workshops at other green spaces across the Canterbury District. We recognise that access to nature is unevenly distributed across the population, with class, income and ethnicity all playing strong, determining roles but we believe that our strong links will local schools and partnership approach, particularly working with established and newly developing Friends groups, will help us to specifically aim to help children at risk of social exclusion, or who are otherwise likely to reach green spaces. Our aim is not to favour nature to the exclusion of technology, but rather use it as a tool to reach out to families and as a fun means of identifying wildlife. Canterbury City Council, Canterbury Society, Whitefriars Shopping Centre, Canterbury Cathedral, Abbots Mill Project, Rough Old Wife Cider, St Peter’s Primary School, Kentish Stour Countryside Project, Friends of Westgate Parks, Friends of Kingsmead Field, The Oaten Hill and District Society, St Mildred’s, Fifth Trust, Canterbury College, Anna Outdoors, Canterbury Christ Church University and University of Kent.